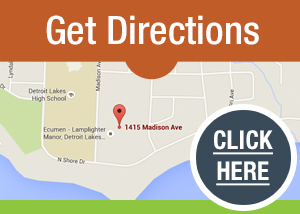 Find your way to Ecumen Detroit Lakes. Ecumen Detroit Lakes is easy to find. Visit us today! Call 218-847-4486 for additional directions. Ecumen Detroit Lakes, Emmanuel Nursing Home, 1415 Madison Avenue, Detroit Lakes, MN 56501. Take a left at the stop light for Jackson Avenue. Travel approximately 2 blocks to Willow Street and take a right. At the top of the hill, take a left onto Madison Avenue. Ecumen Detroit Lakes’ main entrance will be straight ahead. Take a right at the stoplight for Jackson Avenue. Travel approximately 2 blocks to Willow Street and take a right. At the top of the hill, take a left onto Madison Avenue. Ecumen Detroit Lakes’ main entrance will be on straight ahead. Take a left at the Highway 10 stoplight. Take a right at the stop light for Jackson Avenue. Travel approximately 2 blocks to Willow Street and take a right. At the top of the hill, take a left onto Madison Avenue. Our main entrance will be straight ahead. Take a right at the Highway 10 stoplight. Take a right at the stop light for Jackson Avenue. Travel approximately 2 blocks to Willow Street and take a right. At the top of the hill, take a left onto Madison Avenue. Our main entrance will be straight ahead.